We've seen underwater aquariums and even underwater hotel rooms, but an underwater restaurant? The very notion sounds like a fantastic idea from a science-fiction story in the far-flung future, but it's very real and not too far away, set to open to the public in 2019. This underwater eatery is being constructed at Spangereid in the Lindesnes municipality, which is the southernmost point of Norway. Scandinavia is already known all around the gastronomical world for its unique cuisine and delicacies, but this restaurant is truly set to make some waves. Under is being constructed by Snøhetta, one of the most successful architecture companies on Earth. Based out of Oslo, Norway, but also having offices in several key locations around the globe including New York City, San Francisco, Singapore, and Stockholm, Snøhetta has developed an award-winning reputation for pushing the limits of construction and daring to take on surreal projects that truly change the way we look at the world. Under is set to be one of the brand's most impressive accomplishments. It won't be the world's first underwater restaurant, but it will be the first of its kind in Europe and by far the largest of all, capable of hosting up to 100 diners. The name of the restaurant was decided on for several reasons. Naturally, the simplest explanation is the fact that Under will be located underwater. However, the Norwegian word for 'under' can also mean 'wonder', symbolizing the magic of this location and the sense of awe that diners will inevitably feel as they walk into the entrance and slowly down, descending to a depth of five and a half meters below sea level, taking their seats and observing the wonders of the sea through the feature glass wall of the restaurant. All sorts of marine life can be spotted swimming by, including cod, lobster, seals, dogfish, and more. On stormy nights when the waves are choppy, visitors to Under will be treated to a true Scandinavian undersea maelstrom, safe and warm in the comfort of their seats. But how can the restaurant guarantee such lively displays? 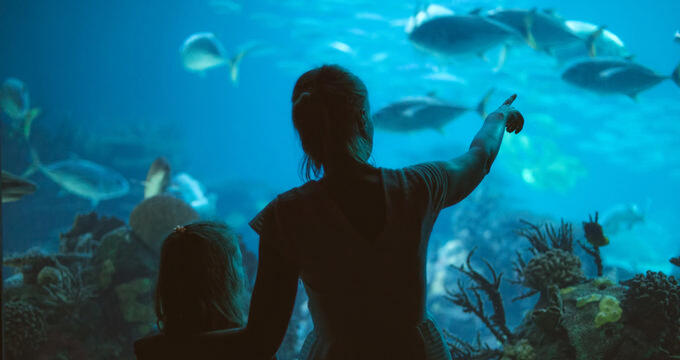 Well, researchers and marine biology experts will also be employed at Under, using sound, smell, and lighting effects to attract various fish and other marine life closer to the restaurant itself, ensuring that there'll always be something going on outside the glass wall. Naturally, Under is set to be one of the most popular dining locations, not just in Norway, but in all of Europe, so any prospective guests will have to sign up on a potentially long waiting list, but the chef and staff will be doing all they can to make the experience more than worthy of any wait. Of course, one of the most exciting aspects of any new restaurant is its menu. The list of dishes, drinks, and desserts at Under is staying under wraps for now, but it has been revealed that the eatery's head chef will be the esteemed Nicolai Ellitsgaard, a highly-experienced and admired Scandinavian chef who has spent time in some of the finest kitchens in the region. Ellitsgaard will be testing out different menu ideas in the build-up to the grand opening of Under in the spring of 2019. In the meantime, the prestigious chef has revealed that he'll be putting a big focus on local products and ingredients. The local beach and waters will provide all kinds of elements to form Ellitsgaard's dishes, including shells, seaweed, sea kale, fish, seabirds, and more. As the seasons change, the style of cuisine at Under will ebb and flow along with them. All guests at Under will begin their experience in the mezzanine area, tasting some samplers and appetizers before descending into the restaurant itself and taking their seats in preparation for the evening ahead. There, guests will enjoy a set menu featuring anywhere from 15 to 18 different small-sized servings, offering a spectrum of undersea delights. The sommelier of Under will also be working hard to select perfect drinks of both alcoholic and non-alcoholic varieties to be paired with each dish.